MONDAY, 05 SEPTEMBER – Universiti Malaysia Sabah (UMS) through the Faculty of Psychology and Education (FPP), today welcomed 13 students under the Creditable Student Mobility Programme for the 2016/2017 session. Of these, six were from Universitas Pasundan (UNPAS), Indonesia whilst the other seven were from Universiti Utara Malaysia (UUM). The welcoming ceremony took place at UMS campus, attended by the Dean of FPP, Associate Professor Dr. Mohd Dahlan Hj. A. Malek, Head of Programme and Escorting Officer from UNPAS, Dr. Abu Haraerah; and UUM Escorting Officer, Dr. Zailly Ahmad Ramli. Speaking at the event, Dr. Mohd Dahlan said, the Creditable Student Mobility Programme was a collaboration between UMS and other universities in realising the Higher Education Ministry’s proposal to increase higher education internationalisation in Malaysia. “This is the second such programme organised by FPP UMS and UUM, where last year the same programme was held in collaboration with Universiti Mercu Buana, Indonesia. “This time, together with UNPAS with many programmes planned, we expect this programme can be further continued with larger strides thus strengthening the relationship at international level,” he said. Dr. Dahlan added, FPP is also sending a total of seven second year Social Work Programme students to UUM tomorrow. 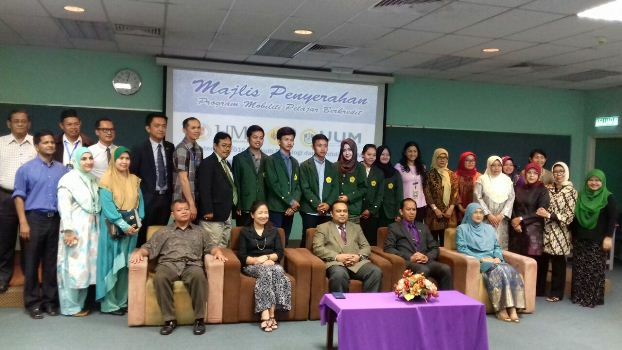 “Meanwhile, five students will depart to UNPAS for the same mobility programme on 20 September,” he said. Also present were FPP Deputy Dean of Academic and International, Dr. Roslee Talib; FPP Deputy Dean of Student Affairs and Alumni, Dr. Getrude C. Ah Chang @ Grace, and the Director of the Centre for International Affairs UMS, Molly Donna Awang Sham.